Grilled eggplant dressed up with a quick soy sauce-serrano dressing. In the Bay Area, we are blessed to be able to grill outdoors nearly year-round. Heck, even my husband has been known to grill in the rain. One of my favorite grilled veggies is eggplant because it takes to being smoke-kissed so well. And its texture turns nearly custardy. 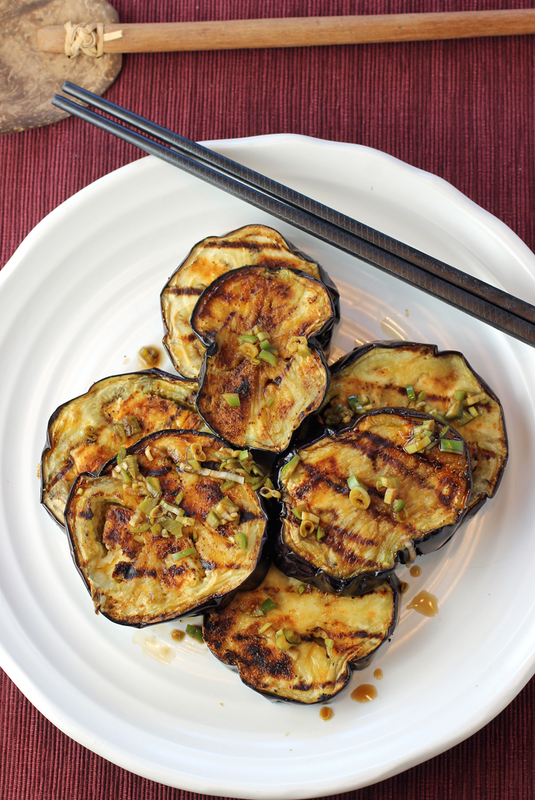 “Eggplant with Spicy Asian Dressing” is a quick and easy dish to enjoy at this time of year when eggplants of all sizes are showing up at farmers markets. 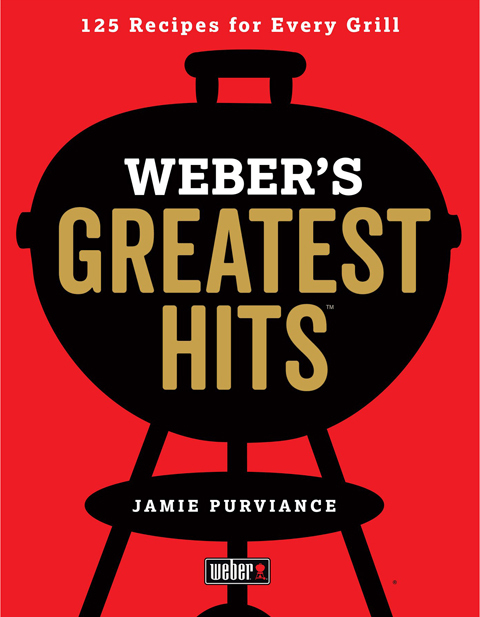 It’s from the new cookbook, “Weber’s Greatest Hits” (Houghton Mifflin Harcourt) by master griller Jamie Purviance, of which I received a review copy. 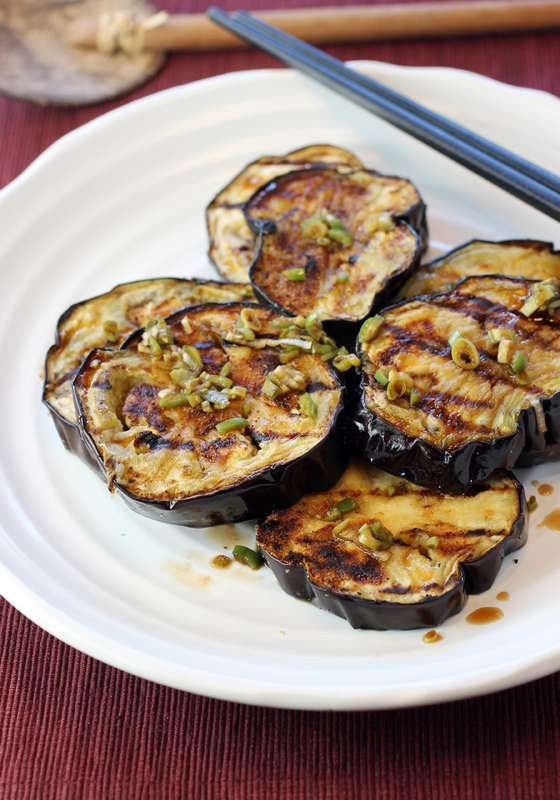 The rounds of eggplant are brushed with oil, sprinkled with garlic powder, then grilled for about 10 minutes. A quick Asian sauce gets stirred up with serrano chiles to dress the eggplant slices right after they come off the grill. You really want the dressing to soak into the eggplant for maximum flavor. The dressing does call for minced yellow onion, but I used green onion since I had it on hand. Because I found the garlic powder a little acrid tasting, I thought the dressing needed something extra to counter it. So, I added a drizzle of toasted sesame oil, which I think smoothed out the flavors better, while also adding a touch of nuttiness. Throw some shrimp, tofu, pork, chicken or beef on the grill with teriyaki, soy sauce or five-spice, then steam some fluffy jasmine rice. With the eggplant, it makes for a satisfying summer meal in no time flat. 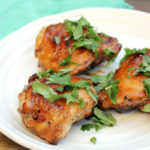 Prepare the grill for direct cooking over medium heat (350 to 450 degrees). In a small bowl, whisk together chile peppers, soy sauce, lemon juice, minced onion, water, and toasted sesame oil, if using. Remove about 1/2 inch from both ends of each eggplant. Cut the eggplants crosswise into 1/2-inch-thick slices. 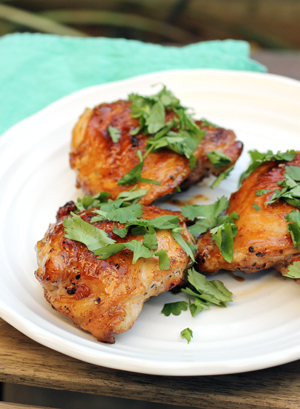 Lightly brush both sides of the slices with the oil and sprinkle evenly with the garlic powder. Brush the cooking grates clean. Grill the eggplant slices over direct medium heat, with the lid closed, until well marked and tender, 8 to 10 minutes, turning once. Remove from the grill. Arrange eggplant slices in a single layer on a platter and immediately spoon the dressing evenly over the top. Serve warm.